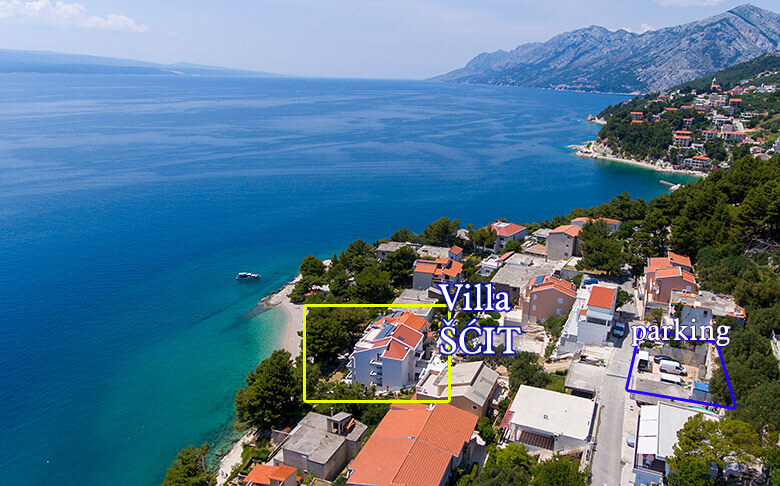 Dear guests, welcome to Villa Scit in Brela. The villa is situated next to the blue sea and beautiful pebble beach surrounded by pine trees. Situated in the part of Brela called Scit, it takes about 20 minutes on foot to the centre of Brela. The nearest shop is only five minute walk away from the villa and the nearest restaurant is 100 m away. Away from the traffic and the usual summer crowd, it is ideal for a peaceful vacation. The villa consists of two parts: the eastern and the western part. The western part of the villa consists of 6 three star apartments A2+2 for four persons and one three star apartment A2 for two persons. 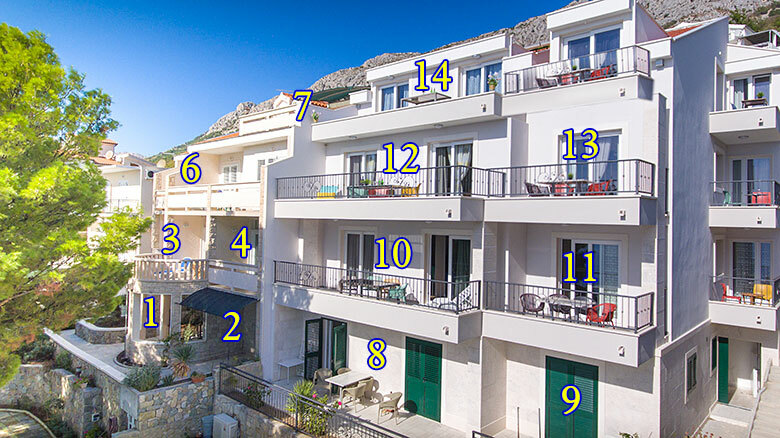 The eastern part of the villa consists of 1 three star apartment A2+2 for four persons (Ap 9), 4 four star apartments A2+2 for four persons and 3 four star apartments A4+2 for six persons. Apartments are spacious and modern and they offer everything necessary for a pleasant and enjoyable vacation. They have air conditioning, Wi-Fi and a SAT/ TV. Every kitchen is fully equipped with the necessary dishes including the coffee machine, kettle and toaster. Microwave oven is available upon request. The 4 star apartments have a dish washer as well. The guests also have access to a barbecue and a washing machine. There is a big terrace under the deep shade of pine trees in front of the villa with chairs and loungers on your disposal. The villa has a private parking space and two parking places in garage which is 5 minutes away from the parking space. The cars on the parking space are parked one behind another and we kindly ask the guests to hand over the car key upon their arrival. This way we make sure that everyone can freely enter and exit the parking space. When asking for a reservation, please specify: the number of adults, the number of children and the number of cars you will arrive with. 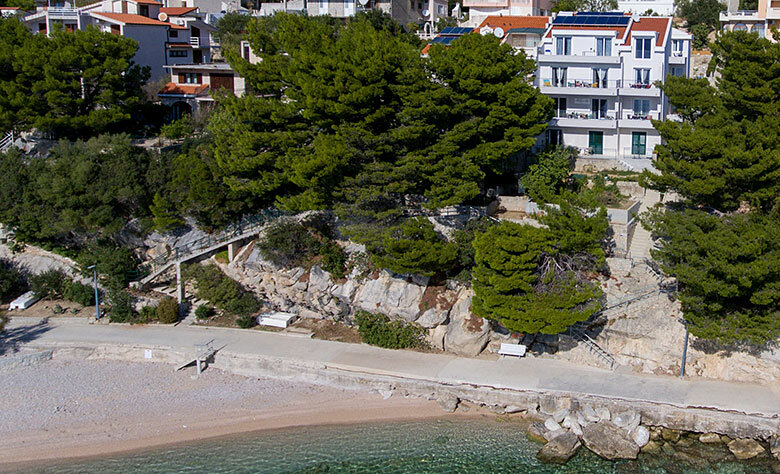 In order to confirm the reservation, a payment of 25% of the total price of the accommodation is to be paid in advance while the remaining amount should be paid upon your arrival in Brela. Payment should be made within five days. Please send us evidence of the payment by e-mail so that we can make a final confirmation of the reservation. Any cancellation up to 1 May will be fully refunded. Our job is to make your stay comfortable and enjoyable. We are looking forward to your arrival!